Pirate’s Booty snacks are fantastic! Here is your chance to win Spongebob themed ones for your kids (or for you). 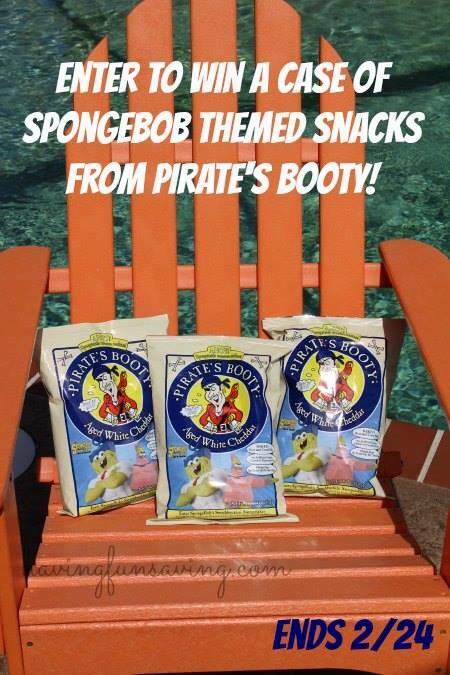 In honor of the NEW SpongeBob Movie, Pirate’s Booty has a LIMITED Edition SpongeBob Themed Aged White Cheddar Snacks available! And you get the chance to win a CASE (that’s 12 full size bags!) of these yummy snacks. Check out the full review HERE. « Buying a New Home? Got Questions? It’s good to eat healthy for yourself, but it’s also a good idea to show your children healthy eating habits when they are young. We really need to eat more healthy snacks, as it is so easy just to reach for junk! When you give your kids healthier snacks now they will take that into their adult lives. My son would rather snack than eat so it’s imperative he snacks healthy! And he’s obsessed with Spongebob so this makes it easy! We love to snack but I worry about excess calories along with additives and chemicals. Pirate’s Booty is healthy and it tastes great….it’s a win-win. My son has a limited amount of foods that he will eat (major food aversions) so it’s super important to me, that what we have available to him are healthy. He has maybe 10 things at a time that he will let pass his lips, so I don’t want them to be filled with chemicals, artificial anything or junk preservatives. Healthy snacks are important to help us to avoid eating snacks that are are filled with sugar and artificial ingredients. Healthy snacks are important because there are so many products out there with more artificial ingredients than real , no good. The healthier we are when we’re young the better off we’ll be when we’re old. They are important because it gives healthy alternatives for people to enjoy. Healthy snacks are important because these days we’re filling our bodies with ingredients that are toxic. This is having an overall effect on our families, our world. Every little step we make toward health is a step in the right direction! A little goes a long way! Healthy snacks are important to my family to keep them satisfied and eating healthy also. Healthy snacks are important to my family because I know that snacking is inevitable so I’d prefer it to at least be good for us. I think that popcorn is a pretty healthy snack. I would love to win this one! As a diabetic, I need to keep my snacks healthy. I’m trying to lose some weight too, so healthy snacks are a good thing. I’d rather give something healthy and FUN in my son’s lunchbox because he would enjoy them! Healthy snacks are important because my kids snack a lot! Healthy snacks are important with all the junk food temptations out there! We are all overweight so I’m always looking for healthy snacks, and these sound delicious! they are important for our health and to maintain our healthy lifestyle. You can’t deprive your kids of snacks so healthy snacks are the only way to go. Kids deserve a treat. I think if you are going to have a snack healthy is best. The occasional fun snack is ok but if you can get a healthy on that is fun that is great too. Healthy is best because why add the additional calories if you don’t have to. I think healthy snacks are great for my family because it can help them maintain their weight. Healthy snacks are important, as snacks are fuel between meals, and that fuel should not be junk and empty calories. Too many processed items pollutes the body and it won’t function as well anymore. Healthy snack are important because is it so easy to eat too much sugar by eating the wrong type of snacks. A person has to take care of their body. If you are going to snack, you need to eat healthy snacks for energy & nutrients. Health snacks are a good idea for anybody. Introducing healthy snacks to your kids will instill healthy eating habits that will last a lifetime! I get so fired up and excited to learn about nutrition and health, it’s amazing to know how food affects you and how much of what is in the store is so bad for you. That is a bootylicious snack offer! My kids growing brains & bodies are very important & I want to keep them healthy. I like healthy snacks because we don;t need all the fake stuff they put in foods these days! Healthy snacks help me manage my diabetes. Healthy snacks are important to help us manage weight! I think healthy snacks taste better. I am a firm believe that what you put in your body can determine how healthy you will be. I am very particular about what my kids eat and it has paid off. My kids have learned to make good choices with what they eat and they enjoy it! health is everything you find that out when a loved one becomes sick. WE have to eat healthy my son is a diabetic and has a heart transplant and celiacs disease so we try to as much as we can. Healthy snacks are important because when you eat them you may eat less sugar and junk food. I am trying to lose weight so I now have the whole group on a health kick and we feel better for it. Snacks are important becuase they keep up my kids energy throughout the day and curb hunger before and after dinner! With kids spending so much more time with electronics and not getting outside I think it is very important to keep snacks on the healthier side. When you’re healthy and fit you can enjoy life so much more because you feel better. Healthy eating helps keep your body healthy. So you do not get in the habit of eating unhealthy and developing health problems! To help us maintain a healthy life style! Healthy snacks are important for the entire family, not just the kids. We all need to eat good foods and that includes healthy snack. These sound yummy. I like my kids to have healthy snack because obesity and thier dad is a dietetic which automatically makes them pre dietetic. So I want to teach how to stay for and by choosing the right foods and staying active will keep them healthy. I love that this is a healthy snack. It’s so tempting for kids to want sugary and fatty treats. What a great company that have awesome snacks. Everything aimed towards kids these days is junk food and my granddaughter needs to eat healthier. It is important to have healthy snacks to make sure we are eating nutritious foods for all meals as well as snacks.